Found 6 file extension associations related to PHPEdit and 3 file formats developed specifically for use with PHPEdit. 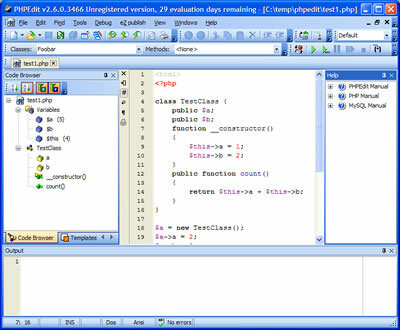 PHPEdit is an Integrated Development Environment (IDE) for PHP designed for professional. Including advanced php related tools, powerful debugger and profiler, code beautifier, help integration, real time syntax checker, advanced keyboard templates and much more. Using the debugger you will produce better software because you'll be able to put breakpoints, step inside your code, watch variable content, check call stack and more. Using the profiler, you will tweak your application performances. Because PHPEdit is fully customizable you can make it behave the way you want. You will not change the way you work, but you'll work faster and easier because all your tools are just a shortcut away. The PHPEdit software seems to be old or discontinued. If you need more information please contact the developers of PHPEdit (Waterproof Software), or check out their product website.